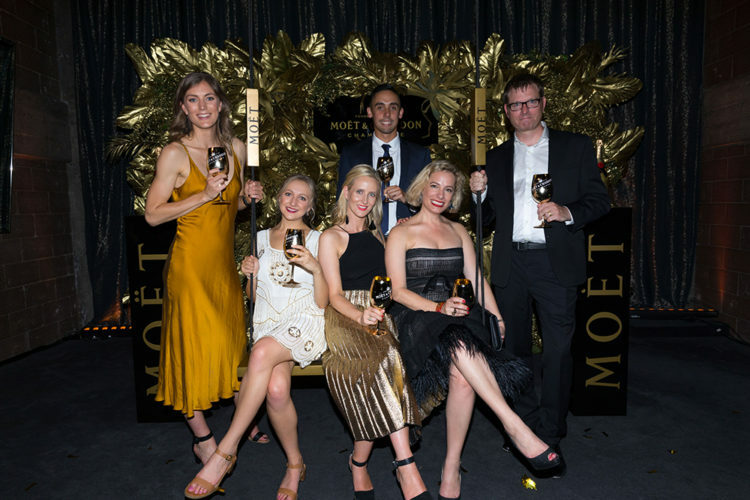 Entrepreneurs, sportspeople and socialites gathered to celebrate five exceptional New Zealanders at the Moët Gold Party. Kicking off the month of December, Moët & Chandon held their exclusive Gold Party at the ultra cool Clooney Restaurant. A bevy of fashionable guests walked the red carpet, partied and commemorated the achievements of Moët’s five chosen awardees. Fashion designer Maggie Marilyn Hewitt, founders of Designer Wardrobe Donielle Brooke and Aiden Bartlett, Black Stick Rose Keddell and entrepreneur Michael Goudie of Clooney Club all received the prestigious Moët Gold accolade in honour of their display of grandeur and generosity in 2017. And in continuation of this charitable spirit, Moët & Chandon have partnered with the award recipients to raise funds for The Akina Foundation, whose focus is to grow social enterprise and support young entrepreneurs. An outfit from Maggie Marilyn, a VIP subscription to Designer Wardrobe and a one-one-one training session with Rose Keddell are among the highly desirable items being auctioned off on Trade Me. With many of these pieces already holding numerous bids our advice is to get in quick as the auctions close December 10.